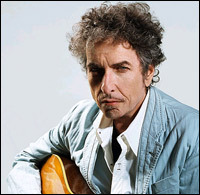 Many of Bob Dylan’s albums are noteworthy for the atmosphere they evoke. The Basement Tapes sounds like it truly was recorded by a group huddled together in a basement (which it was, in part, but that’s not really important). Oh Mercy evokes the gothic New Orleans streets outside the studio. Blonde On Blonde has always sounded to me like the music of a shanty fishing town. Together Through Life is one of the best examples of Dylan’s work creating an atmosphere. In this case, it’s the sound of a dive bar on the U.S.-Mexico border. The instrumentation (particularly David Hidalgo’s accordion), Dylan’s hard-luck vocals and the songs themselves all paint that place vividly in my mind. I love how wizened, and wise, Dylan has become over the years. He’s been a legend practically since he began recording but now he looks and sounds like a legend — like an ancient gunslinger who’s left behind a trail of men he’s slain and women he’s loved. The kind of character who isn’t the good guy or the bad guy in a movie but a rich combination of the two. Together Through Life isn’t Dylan’s best album… it’d probably struggle to hit the top 15. But even its modest ambitions are infused with the knowledge and passion of a true master who has transcended popular music. This entry was posted in dylan weekends and tagged Bob Dylan, I Feel A Change Comin' On, Together Through Life. Why a gunslinger? I never imagined Dylan as the violent type. I do agree, however, that certain people have the look of a legend. Dylan, in the past couple of decades, probably, has that look. As these weekends have passed, month after month, I’ve been amazed by just how many songs this man has created. He is a musical Picasso, far more prolific than his contemporaries. It’s intriguing how that productivity tends to make an artist’s individual work less valuable. If an artist only creates five albums in a career (or paintings or novels), each is regarded with respect and awe. Look at Harper Lee, for crying out loud! One book in her entire career, but what a book it is. I like this song, and if it had appeared on one of five albums Dylan had made, I might have actually heard it before. Instead, it gets lost on his ??? – what number was this? – album. Other than Dylan diehards, how many people have ever heard the songs on this album? I’m not saying that’s a bad thing. I just find it interesting. I looked up the sales data and the album did better than I expected. More than 300,000 copies in the U.S. and chart-topping debuts around the world. Certainly none of these songs will ever have the profile of his biggest hits, but it seems they’ve been heard by a whole lot of people by today’s standards. I think the difference these days is that “albums sold” probably captures the whole audience of this album, while songs by contemporary artists who haven’t sold 300,000 albums have been heard hundreds of thousands of times via YouTube, iTunes and all the rest. I believe this is the best song on the album, but there are two or three really rough spots where the vocals are concerned, and though I wouldn’t normally be too crticial of this — especially at this juncture of his career — the fact that they occur in such a melodic, tuneful song, really makes them stand out and, unfortunately, reduce the overall impact of the song. If only he had re-recorded a few lines where his voice really croaks. I’m thinking that Dylan, Mark Knopfler, Leonard Cohen and Randy Newman need to have a “croak-off.” May the best croakster win! Good song, but get this poor legend some honeyed tea and a throat lozenge!